Internet to come home to! We connect you to high speed internet. No wires required. 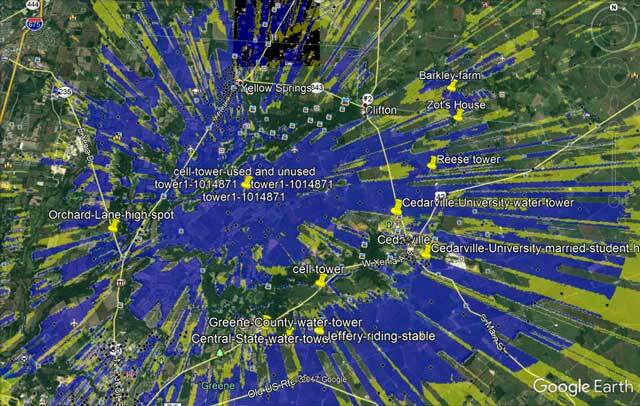 This figure represents a Propagation Study that was done on our first tower. If you are in a blue area, you should be able to get good coverage. Yellow, less so. However, the coverage is based upon a 20′ elevation for the customer’s antenna. Rural residents may already have a TV tower or a building that is higher. Additionally, we have a 25′ mast that can be set up to test for a good signal. The site survey is free even if it doesn’t look good – sign up and we will check out your address. At the moment we are working through our initial customer list in order of when people signed up, but making a few exceptions if we’re already in the area. You might have an option to receive your internet connection from a geeky neighbor or a company that uses old, slow technology to serve your home. We make you a personal promise to give you the best service possible with the latest technology available. Since we have no old equipment you will get the latest LTE (like your cell phone) for the fastest speed available within the FCC rules. Our system will be supported by a direct connection to the core of the internet. We will give you as much speed as possible (there are limits with bandwidth because of FCC rules) and our radios are already capable of utilizing the increased bandwidth that will be available with the soon to be changes in available spectrum. Standard installation – if you need a mast to see over the trees it will be extra. You can have the option to pay off the installation in 3 months with your regular monthly subscription. You will not be on a contract, but if you cancel early you will still be responsible for the installation charges. All the hardware is ours and we’ll keep it running. You may cancel at any time you no longer need the service.